First Indian Postage Stamp depicting Indian National Flag was issued on 21st November 1947. Two other stamps were issued on 15th December 1947. Release of stamp was notified by Postal Notice No. 43 dated 19th November 1947. It is hereby notified that in commemoration of India's Independence new postage stamps in pictorial design are being issued in three denominations, namely 1½ annas, 3½ annas and 12 annas. The new 3½ annas stamp will be available for sale at Post Offices in India on and from the 21st November 1947. The remaining two denominations will be released on the 15th December 1947. All the three denominations will remain on sale upto April 30, 1948. These commemorative stamps will be used for all postal purposes and will not replace ordinary postage stamps of the corresponding denominations which will continue to be current. 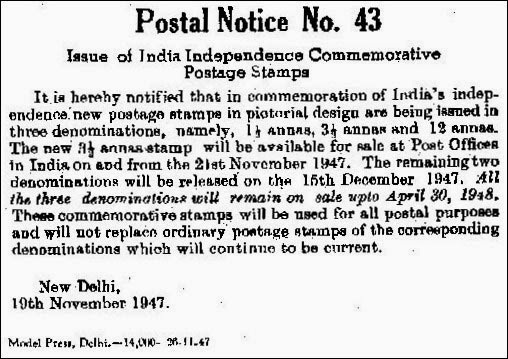 Every Indian who is passionate about its philately has seen the stamps issued on the day of independence but not everyone had seen this notification. I am seeing it for first time.Thank you ,Mr Pandya.